BOSTON, MA, Sept. 26, 2017/PR Newswire/ - Two weeks after Hurricane Irma hit Southern Florida, ten fuel trucks from New England are on their way home after working with FEMA in both the Texas and Florida restoration efforts. When the trucks were requested to head to Florida, Massachusetts-based fuel distributor Dennis K. Burke, Inc. already had trucks working with FEMA in Texas. Diesel fuel and gasoline were needed for generators, first responder vehicles, and other needs on the ground. Along the way, the drivers saw convoy after convoy of utility trucks and tree-cutting crews heading there too. At the peak of Hurricane Irma, 15 million people were without power. 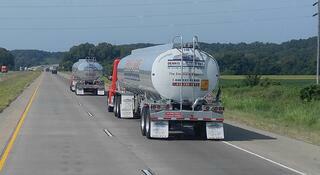 Fuel trucks were sent to help support the utility vehicles traveling to some of the worst hit areas of Florida. One of the Burke trucks was assigned to meet up with utility trucks from Texas, and traveled with them through the night, fueling their trucks and equipment as they worked their way down to a staging area in the Orlando area. Support was pouring in from around the country, and their vehicles needed fueling too. About 27,000 utility workers were working their way across Florida to restore power. That’s not including the tree-trimming crews that worked alongside the utility workers. The utility crews and tree-cutting crews stayed overnight at 20 staging areas across the state. At these staging areas, trucks and equipment were fueled while they were parked and out-of-service. Each of these sites provided fuel, food, water, showers, and a place to sleep for about 1,000 workers. Power has been restored in most areas, except in areas where there was extensive flooding or tornado damage. Clean up continues, and for many storm-ravaged neighborhoods, the long road to rebuilding has begun.